CASH INVESTMENTS, THE FED, AND INTEREST RATES - Cash instruments paying higher interest. When we speak of portfolio allocations, we typically use percentages such as “60/40,” which generally means that riskier assets, such as stocks, comprise sixty-percent of a portfolio. The remainder of the portfolio will generally be made up of safer, or less risky investments such as bonds or cash. The more bonds and cash that are included in a portfolio, the less volatile, or the less risk of losing money the portfolio will typically have. However, the “cash” portion of a portfolio has generally produced little, if any positive return for the past several years (see chart) – and that’s before we take into account inflation. The lack of a meaningful return on cash meant that in order to outpace annual inflation, a greater allocation to higher risk assets was required. But things are different today with returns on cash equivalent investments such as CD’s, short-term bank notes, and U.S. Treasury’s. 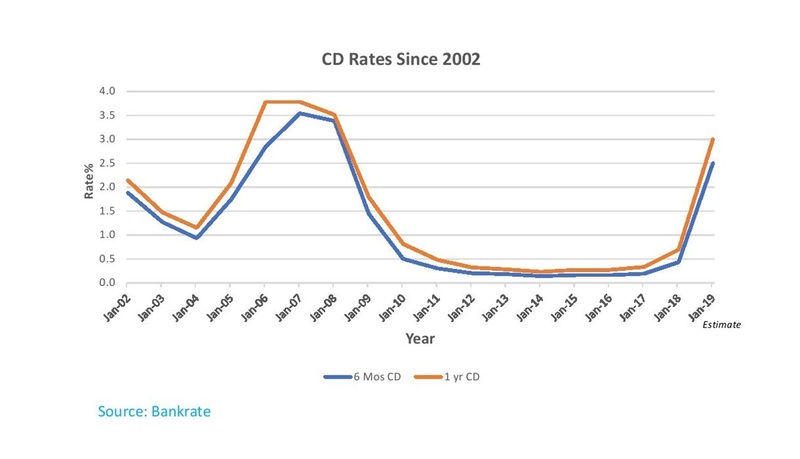 For instance, CD's currently are returning anywhere between 2.20% to 3.0% on maturities of 3 months to 2 years (as of 12/28/2018). Cash has become a “player” in the allocation process and according to the Federal Reserve, there may be more rate increases in 2019 (or not). But there’s another added benefit to CD's offered by most banks – they carry FDIC (federally insured) protection up to $250,000 per account. The chart below illustrates that other than a brief three-year period from 2006 through 2008, the rates today are the highest they have been since 2002. There are a few reasons why interest rates rise (I’ll do a blog on that later), but the one that appears to be driving the current surge in rates the past few months is the monetary policy of the Federal Reserve. In short, the Fed mainly views the unemployment numbers as a predictor of potential unexpected inflation. If they feel the economy is becoming “overheated” by having employers pay higher wages to a shrinking labor pool, a remedy available to them is to try and “slow down” the economy. The reasoning is if employers are forced to pay higher wages, then prices (inflation) may rise to offset the higher labor costs. Currently, we have the lowest unemployment numbers in over four decades - so the Fed is responding by raising rates to combat potential unexpected inflation. The U.S. financial markets are already expecting inflation of about 2%, which the markets have already built into asset prices. But if inflation becomes greater (or lower) than 2%, then the increase (or decrease) is said to be unexpected inflation. Unfortunately, the Fed’s act of raising rates¹ cannot be determined a success or failure at stopping unexpected inflation at the time of the increase since we can’t be sure if the change in future inflation was a result of the current action or non-action of the Federal Reserve. What can be seen immediately, however, is the short-term reaction by the stock market to an unexpected hike in short-term rates, as we witnessed last week. ¹The Fed only changes the “fed funds rate” - the rate at which banks borrow from each other. 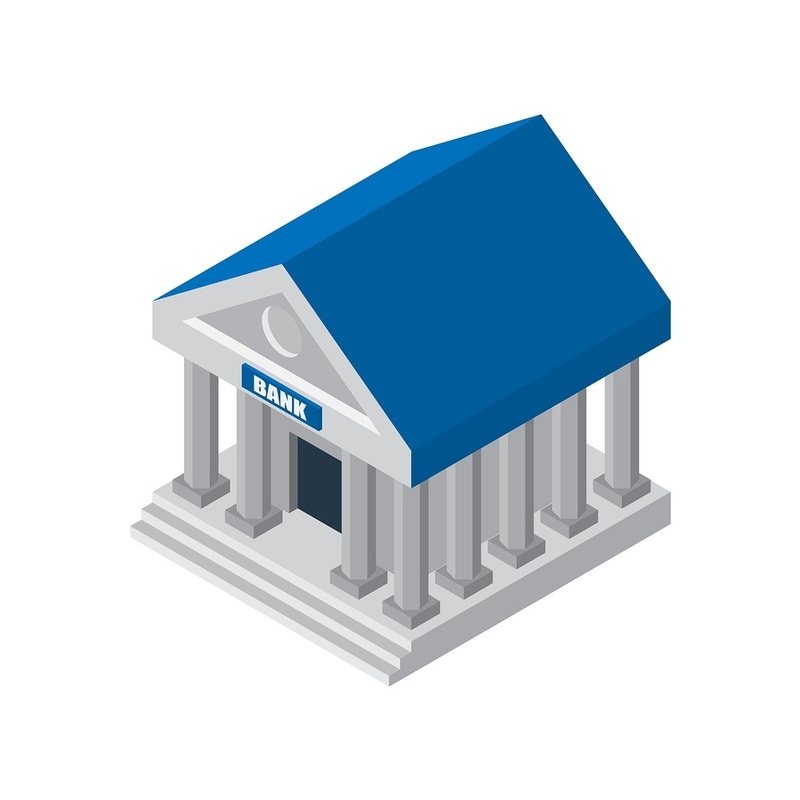 The bank rates to customers usually follow suit but are controlled by each bank. On the surface, there is something counterproductive in engaging in an act that tries to intentionally slow down the economy, but raising rates can be viewed as harmful to a growing economy, as evident from last week's stock market plunge. But I don't believe that the market’s continued slide through Christmas is totally related to the most recent rate hike announcement of a quarter-point, which was the fourth such raise this year, and which the consensus of economists had expected to happen prior to the announcement. Markets react to information in seconds, so the rate hike may have helped ignite the fall, but there’s much more going on (later blog). From a business perspective, there is the possibility that rate hikes could have an adverse impact by increasing borrowing costs for companies and consumers. If it costs more to borrow funds, then companies will stop investing, hiring, and expanding - usually an ominous sign for the stock markets. But the end objective for the Fed is to stop unexpected inflation from increasing to out-of-control levels. This is where the individual, especially retirees who live on mostly fixed incomes, become important participants with skin in the game. If the main cost components of a retiree’s living expenses (health care, housing, food, energy) are rising faster than their incomes, then our largest segment of the population will not have the resources to help keep the economy growing since approximately 2/3rd of our country’s GDP is derived from consumer demand – this would also have adverse consequences in the capital markets. A great scenario for all would be for the Fed to increase rates to the extent it keeps their expected inflation rate in check; the economy steadily grows; and the periodic rate increases help retirees earn more on their savings instead of having to accept more risk than they thought they would have to at this point in their lives. But the actual scenario will most likely be different. As we continue to be reminded by the markets that the future is uncertain, we do have control, however, of the type of investments we choose. Each different type of investments has its own expected returns, risks, fees, tax-effects, and other characteristics that can either protect against volatility, or attempt to profit from long-term risk/return relationships. Please visit our website at www.carrwealth.com or contact us to schedule a no-charge initial consultation. We are confident it will be worth your time.